Streamline order fulfillment processes by using ergonomic industrial carts and warehouse desks that are designed for the task. BHS shipping and receiving equipment aids in order picking, packing, shipping, and unloading. 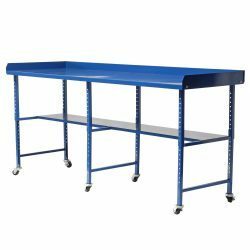 Sturdy packing desks and reliable steel carts can optimize the order fulfillment process for retail distribution and many other industrial and commercial applications. Click on any of the products listed below for more information or call our sales team at +1 314 423 2075 to find a dealer near you. 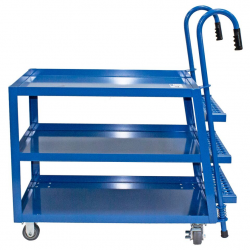 Industrial carts with integrated fork pockets. 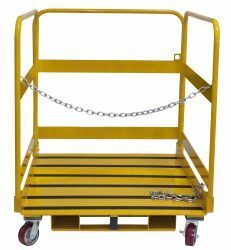 Ladder carts with multiple shelves for bulk order picking. Use a forklift to safely elevate staff for overhead maintenance tasks. Transform lift trucks into OSHA-compliant personnel lifts. Customizable warehouse desks to improve ergonomics. 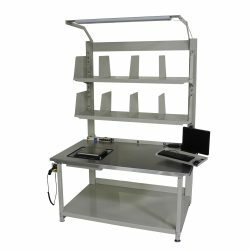 Ergonomic variable-height work stations for order packing. BHS Order Picking Carts are designed to quickly process orders and keep product flowing. The cart allows visibility from all four sides while keeping merchandise securely in place with lipped shelving. 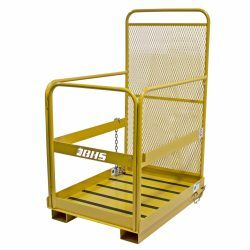 The Order Picking Cart is ideal for unloading packages, counting inventory, stocking shelves, gathering parts, or picking merchandise. The OPC has a heavy-duty steel construction to allow for heavier loads. The durable powder coat finish is both anti-corrosive and scratch-resistant. Four shelves come standard, but custom-built models are available to meet your specific needs. 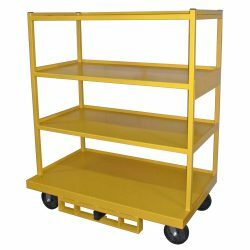 All Order Picking Carts are just over 72 inches tall, and the four models offer different dimensions to meet a variety of needs. If you have specific requirements, just ask. We can custom build Order Picking Carts to meet unique specifications. All models have two swivel and two rigid casters which allow staff to position the cart manually. Fork pockets accept transport by lift truck when necessary. A poorly designed shipping/receiving desk slows productivity and causes unnecessary repetitive motions, leading to fatigue and strain. BHS Shipping/Receiving Desks avoid these pitfalls by improving access to order-filling supplies, like barcode scanners, shipping labels, and computer monitors. The SRD is also fully adjustable with a variety of modular features for optimized ergonomics. The BHS Shipping/Receiving Desk offers many custom options that can eliminate unnecessary motions and save valuable time. A steel scanner gun caddy can be mounted to the right or left side or the front of the desk. Counter cutouts lined with heavy-duty vinyl are available on either side to accommodate right- or left-handed operators. A 48-inch fluorescent light fixture illuminates the entire desk to reduce eye strain. A detachable supply caddy has multiple compartments for basic office supplies, while a Paper Roll Bar and Label Roll Bar keep these essential supplies easily accessible. Once you’ve fully customized your Shipping/Receiving Desk, we can even laser-cut your logo into the exterior shelf plates. For an in-depth look at either of these models, download a detailed PDF from the product page. Our sales staff are always ready to discuss the benefits of BHS shipping and receiving equipment. Call us at +1 314 423 2075 to learn more, or download our product literature here.